Nepal walking tour or Nepal walking tours travel informations! Nepal walking tour or free day tour or day hiking tours in Nepal provides you with spectacular views of the mountains and the deep valleys, as well as a chance to become acquainted with the Nepali people lifestyle, their art, architecture, and cultural traditions. Nepal walking tour or day hiking in Nepal is very popular among those travelers who want to do trekking, but do not have sufficient time or are not physically fit for long treks, or are worried about altitude sickness. Hiking is suitable for children, old or weary trekkers, as it does not entail any particularly long walking days, and there is always plenty to see. There are many popular day tour spots for one or two-day hiking to discover natural and cultural heritage. Nepal hiking or walking tour takes place on trails in rural or urban areas for a single day or longer day trips. You just drive to a start point of a trail and begin the hiking. An average days hiking includes roughly about 3 -6 hours hiking through villages, forests and beside running pristine rivers. For an overnight, you can stay at a hotel. Your belongings will be taken to your destination by car. You just need a light day pack on your back to carry mineral water, your valuables things like passports and cameras etc. 2 nights 3 days Chisopani to Nagarkot walking tour. Chisapani – Nagarkot walking tour is the nearest hiking trails from Kathmandu valley situated on the north side of Kathmandu which is near Langtang trekking region Nepal. Chisapani Nagarkot hiking is suitable for those hikers who are unable to trekking in Langtang region but want to see the great panoramic view of the Himalaya range, Nagarkot hiking is the ideal trip for those hikers. Nagarkot is a popular hill station famous for mountain vistas especially sunrise, sunset views in the Langtang Himalayan range, rural lifestyle, people, flora and fauna. It is a perfect weekend spot for mountain viewers in quiet and comfort destination. Hike to < Nagarkot or Nagarkot hiking is a quick spot for nature trail lovers, offers a break from the bustling life of Kathmandu gives lifetime hiking experience. The main attraction of Chisapani Nagarkot hiking is panoramic sights of Himalayan peaks including Annapurna, Manaslu, Langtang lirung, Gaurishankar, Dorje Lakpa and Ganesh Himal etc. Nagarkot is one of the most popular tourist destinations with spectacular scenic views of mountain range. Hiking in Nepal is a unique experience because Nepal is a hiker s paradise. Hiking over the hill station of Himalaya is an impeccable way to explore the magnificent views. Hiking is an outdoor activity which consists of walking in natural environments often on nature trails. Chisapni Nagarkot hiking tour can start either from Sundarijal or Changu Narayan temple. Let us know your own itinerary than we send you special deal. Nepal walking tour Shivapuri / Shivapuri 1 day hike. Shivapuri National park is located in the northwestern part of Kathmandu, the capital of Nepal. It is the second highest hill after Phulchoki near the Kathmandu valley located at an altitude of 2563m is absolutely a paradise for bird watching lovers. Shivapuri hiking can be done within 3 hours up to 6 hours according to your time bound. Visiting Shivapuri offers an excellent view of Langtang Himalayan range with Ganesh Himal family and could be an ideal place for travelers who are not able to do longer treks. There are 2 options for you for day king tours on Shivpuri National Parks. Nepal walking tour Pokhara city 1 nights 2 days day tour. Pokhara valley hiking is a popular hiking area, hill station like sarangkot, dhampus are the viewpoint of panoramic mt.annapurna view. sarangkot hill station is located at an altitude of 1592m. This small hill station can be reached by just a short scenic hike through tiny villages – jungle from the main touristic hub of Pokhara, or a 45 minute private driving by Taxi. 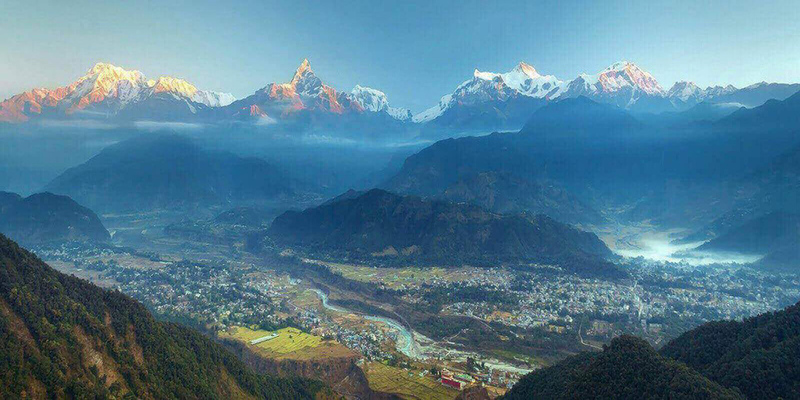 Sarangkot is a beautiful village best known for its sunrise, where on a clear day you can see an unobstructed view of the Himalayan mountains of Annapurna family including Manaslu, Dhaulagiri range and Fishtail. 1 day Kakani walking tour. Kakani hiking leads to the east along the blacktopped road. The entire trail goes on a level path where can be seen numerous picnic spots and small village en route. We hike for about three hours to Bhanjyang with about 20 minutes steep climb before we reaching there. A few hours strolling around here and having packed lunch, we retrace the same way back to Kakani in about two and half hours and drive back to Kathmandu. 1 night 2 days Balthali village walking tours. Balthali Village trekking or Balthali village Tour is one of the brilliant tourist places for those who are relatively looking an easy, short and family trekking with children. Balthali village is situated ahead of Panauti about 40 km far from Kathmandu in front. It offers a sunrise in the east, speculating Himalayan range from Mt.Manaslu to Mt. Everest in the north, innumerable rice terraces in the west and the huge bodied green forest of Mahabharat range in the south. The most important feature of this destination is that it is warm in the winter and cool in the summer. The area of Balthali is cover of various flora, colorful rhododendron forest, and magnolia and Sal trees. So, it is also a perfect place for nature lovers and bird watchers. Most of the sacred and ancient temples and monasteries such as Namobuddha hill station with its cultural history, Indreshwor Mahadev and Bramayani Temple are located along this route. Balthali village trek can be done within 1 night 2 days or 2 nights 3 days trip from Kathmandu.